Many of us love spicy dishes but find it daunting to prepare the chili mix which breathes life unto these savory delectables which are part and parcel of our culinary repertoire in this region. “Rempah” as it is commonly known in Singapore and Malaysia, otherwise called “bumbu” in Indonesia is the heart and soul of Southeast Asian cuisine in this part of the world. But there are many different types of rempah in existence, “rempah titek“, “rempah gerang asam“, “rempah kuning“, “rempah cili-bawang” are just some examples, which we will explore in the course of this blog over time but is there a rempah which is most commonly used amongst many dishes? Indeed there is. I call this “generic rempah” for ease of remembering, something I’d mentioned and used in many of the dishes I’d introduced earlier like laksa lemak, kangkong masak lemak and rendang ayam. Its versatility extends beyond these dishes of course, some of which I would prepare and blog about in time to come… hopefully. 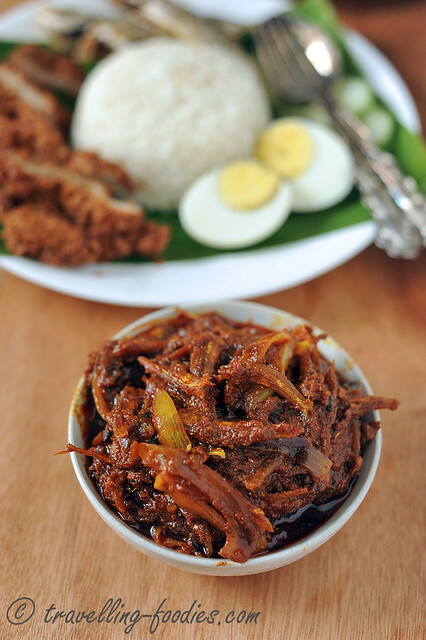 A large batch can be made and it stores pretty well but just to put it into immediate use after its been freshly prepared, I’d used the generic rempah in a simple recipe for Sambal Ikan Bilis, an indispensible condiment in our favorite nasi lemak. 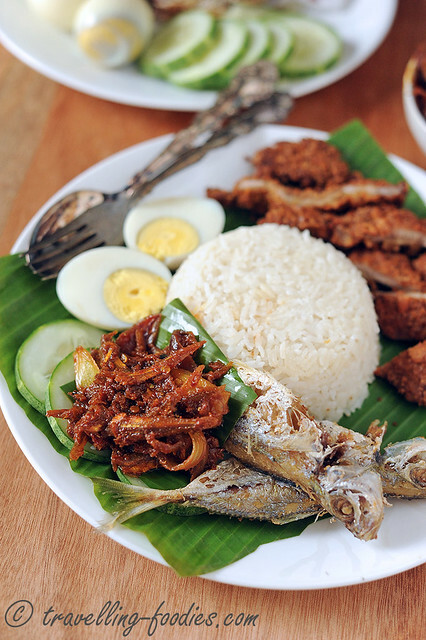 Nasi lemak is a favorite amongst Singaporeans and we eat it around the clock during any time of the day. 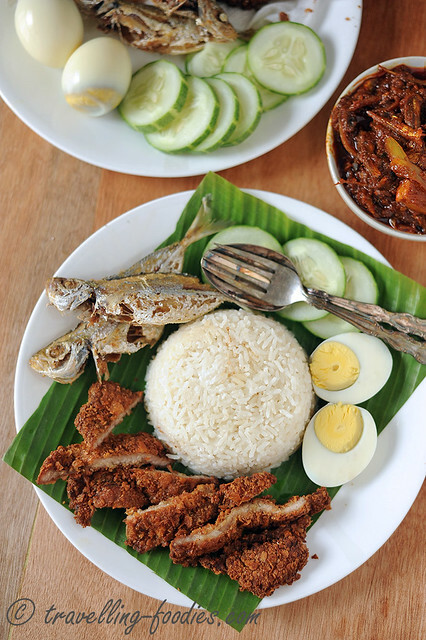 For some, nasi lemak is how they begin the day, grabbing a packet of banana leaf-wrapped nasi lemak, which contains a simple fare of rice steamed in coconut milk, an egg which can be in the form of an omelette or simply a hardboiled telor rebus, and of course the fried-until-uber crisp ikan kuning on the way to work, to be enjoyed with teh tarik in the office pantry. For others, it is eaten as supper, usually more elaborated and complete with goreng ayam berempah and some other side dishes like sambal terong or sambal kacang panjang. 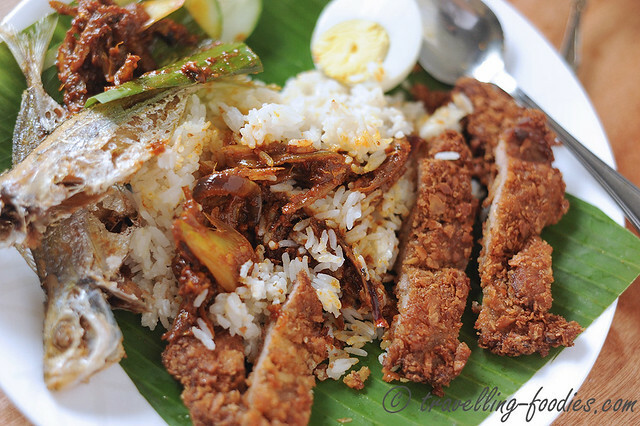 But no matter which “version” of nasi lemak one is having, the sambal chili that goes along is an absolute must and it must be enjoyed in copious quantities or the nasi lemak experience would surely be rendered “tak shiok“. 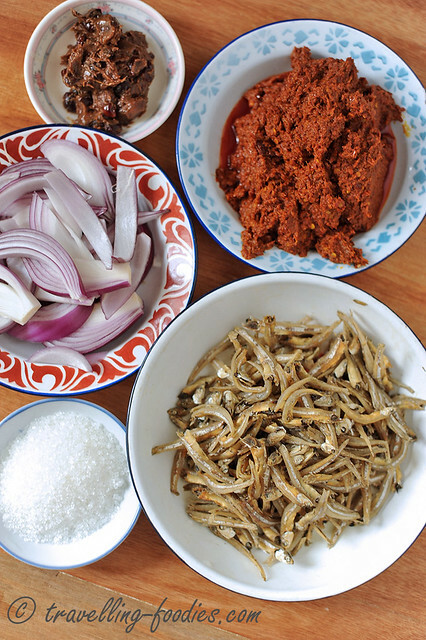 There are many recipes for the sambal ikan bilis. Some are simpler, calling for only cili boh, which is essentially dried chilies which had been soaked in boiling water until soften and then blended into paste, others like mine uses slightly more ingredients for a broader spectrum of palatal experience. To each’s own really because I think no matter which version you use, as long as it is properly cooked with tender loving care, it would taste just as great with the nasi lemak! The art of rempah making is an important step to getting to know the cuisines of the Malay Archipelago. For many culinary cultures in this region, rempah making is symbolic and almost synonymous to the dishes which are representative of the rich heritage. Take the Peranakans for example. The Straits Chinese community in the olden days practiced an elaborated wedding ceremony which lasted for 12 days, not counting the months of preparatory work which preceded the actual event. Amongst the numerous ritualistic and ceremonial activities that unfold over this joyous period of jubilation, two particular days were closely related to rempah making. First is “ari kupas bawang” which was usually four or five days before the actual wedding itself. Literally meaning “Day of Onion Peeling“, this was when the ingredients needed for the countless celebratory eating and merry making were being prepared, most notably and necessarily the endless peeling of the molehills of shallots, onions and garlic quintessential in some dishes, like Babi Chin, otherwise to be churned into rempahs for dishes like Ayam Masak Buah Keluak. Then there was “ari memyambal“, a day when different sambals were cooked to accompany the various dishes served at the Tok Panjang feasts during the twelve-day long wedding, especially sambal serundeng for the customary nasi lemak for attending guests. This was when the dapor (kitchen) became very alive, packed with all the chitter and chatter of nyonyas and bibiks from near and far who had been summoned to help out with the prep work. Some more well-to-do Peranakan families would engage the service of “chong pos”, Hainanese chefs whom otherwise served the British colonial masters of the time but for most, all the cooking was done by fellow family members and their “mah cehs” (maids). For many, the best rempah is one where the ingredients were all individually and meticulously hand-pounded with a batu lesong (granite mortar and pestle). With the aid of modern technology, most have converted to using food processors and blenders instead, a little sacrifice of “authenticity” for time and convenience. For me, the rempah frying process is one which I still try to do on my own whenever possible. This is when one learns of the transformation the ingredients undertake during the “tumis” stage. While some changes are very visual and apparent, some other naunces like changes in aroma and colour can be rather subtle. 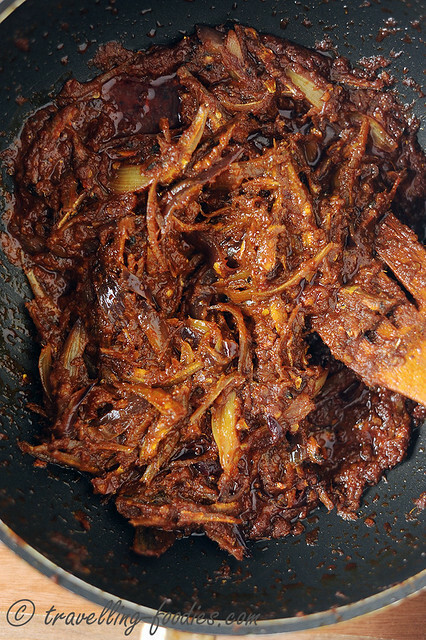 With the generic rempah prepared, transforming it to become sambal ikan bilis is a breeze. The ingredient list is reasonably short as well. For me the role of the sugar is pivotal, adding a sweet edge to the sambal, balanced by the sourish juices from the tamarind pulp. When buah belimbing is in season, I would add these wild cousins of the starfruit instead for the tangy hues they provide. As the rempah had already been thoroughly cooked prior to this until it “pecah minyak“, it is all a matter of getting the dried anchovies and onions fried until they are of the right textural consistency before adding the rempah for a quick toss. The final consistency of the sambal really depends on individual preference. Some prefer it more wet for easy drizzling over the piping hot steamed rice, others like it drier and hence more “pekat” in flavour. Like the generic rempah, the sambal stores pretty well too, lasting for a week or slightly more when refrigerated. After the sambal is prepared, all that is left is for the coconut milk rice to be steamed, and some other side dishes to be cooked or fried and one is ready for a simple nasi lemak feast! 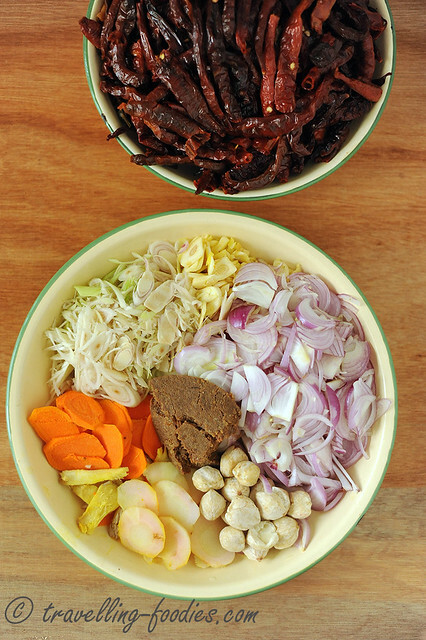 Blend or pound all the Generic Rempah ingredients except the reconstituted dried chilies into a coarse paste. Grind the softened dried chilies separately into a paste. Add cooking oil to a heated wok over medium low heat and saute the rempah ingredients until fragrant. 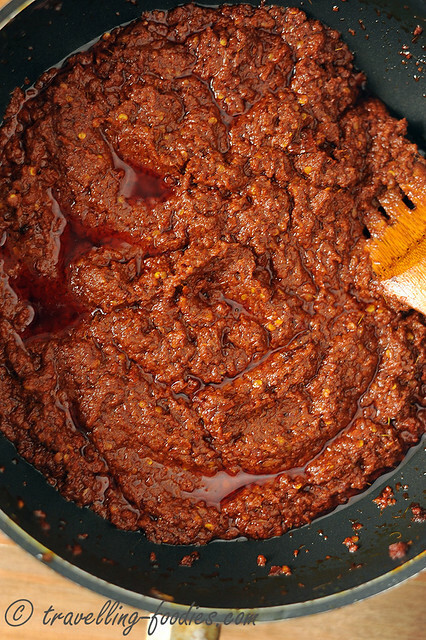 Add the dried chili paste and continue to saute until uniformly mixed. Continue to saute under medium low heat until the rempah “pecah minyak”, i.e. when the rempah darkens considerably, starts to glisten as the oil begins to separate from the paste. The change in aroma should also be noticeable. Turn off the flame and leave the rempah to cool down completely before storing in containers. The containers can be chilled or even frozen for later use. Rub the tamarind pulp in the cup of water and strain the juices. Set aside for later use. In a wok, add cooking oil and saute the ikan bilis under medium heat until aromatic. The ikan bilis will start to brown slightly and become crisp. Drain the ikan bilis and set aside. Add generic rempah and stir fry with onion until well mixed. Next, add the tamarind juice, salt and sugar. Heat to evaporate some moisture to the preferred consistency. Return crispy ikan bilis back into the wok and toss to evenly coat. Taste and adjust with more salt or sugar. 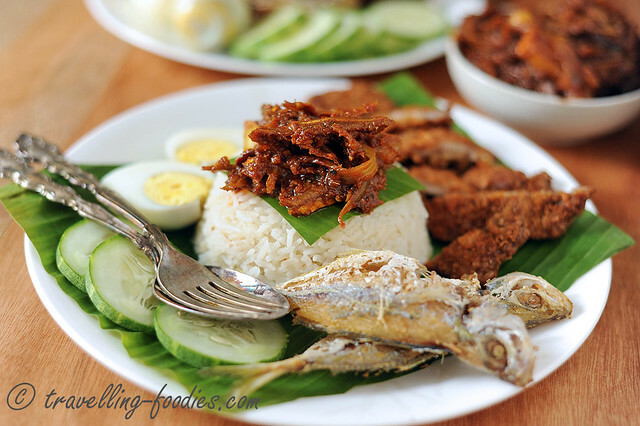 Serve the sambal ikan bilis with nasi lemak and suitable side dishes. This entry was posted on August 27, 2015 by Alan (travellingfoodies). It was filed under Food, Simple Eats and was tagged with anchovies, asam jawa, bawang merah, breakfast, chili, cili boh, ikan bilis, malay, nasi lemak, Peranakan, rempah, sambal, telor rebus. I love all those flavors. I am definitely going to have to try to make your sambal recipe! HI Thanks for sharing this recipe. I am a Singaporean living in BC Canada. Love your food blog and all your travelling/makaning adventures. Keep up the excellent job. Thanks Alan for the sambal recipe. How do you cook the coconut flavoured rice..?